Veterinary medicine has two main goals: preventing disease in our pet population and restoring health to our pets should they get sick or hurt. 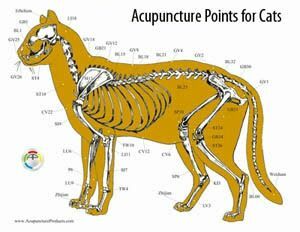 The goal of acupuncture and Traditional Chinese Veterinary Medicine is to bring balance to the body. Acupuncture can stimulate the body to begin to heal itself. 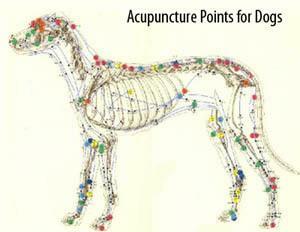 We use acupuncture in addition to modern western diagnostics and treatments to restore health. Acupuncture involves inserting very thin sterile needles into specific points on the body. The acupuncture points follow nerve tracts within the body (which are called channels or meridians). The specific acupoints are areas where free nerve endings and small arterioles gather. The small local reaction caused by the needles has been scientifically shown to release neurotransmitters, which activate the body to begin healing. Acupuncture is most commonly used to help control painful conditions, but has been used for many other conditions such as diarrhea, constipation, paralysis, cough, seizures, and endocrine diseases. It can be a great tool to help geriatric pets and can improve quality of life for pets in hospice care. Some pets will see an immediate improvement, but it can often take 2-3 sessions to see a noticeable change for chronic conditions. The acupuncture itself should take 20-30 minutes, but the session will likely last an hour, especially the initial session.